Usain Bolt will have to qualify for the 100 metres at this year’s world championships after Jamaican officials decided the country’s automatic entry into the race should go to his training partner Yohan Blake. 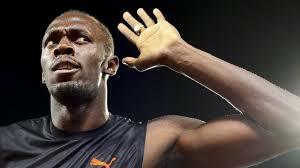 But Bolt was given his country’s wildcard entry into the 200m after the Jamaica Athletics Administrative Association ruled in his favour for the longer sprint. The JAAA was forced to choose between its own athletes after the sport’s world body ruled that only one wild card would be allowed per country for each event. Jamaica had two runners in each race who were entitled to wild cards. Bolt qualified for the 100m after winning the event at last year’s Diamond League and the 200m after he won the event at the last world championships in 2011. Blake also qualified for the 100m after he won the blue-riband race at the 2011 world titles. Nickel Ashmeade qualified for the 200m, as last year’s Diamond League winner. Faced with a dilemma over who to choose and who to leave out, the JAAA’s President Warren Blake announced it’s decision on Wednesday (local time). ”The executive of the JAAA has decided that in cases where Jamaica has both the Diamond League champions and the defending (world) champion, it is the defending champion that will get the nod,” he said. The decision means that Bolt, Blake and Ashmeade will all have to compete at the trials in at least one event. The trials start June 20.